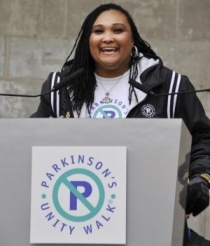 PRINCETON, NJ: The Parkinson Alliance has hired GCI Health to raise awareness about Parkinson's Disease as well as the group's 2013 Parkinson's Unity Walk, which will take place April 27 in New York City's Central Park. Last year, more than 10,000 participants raised $1.8 million for research through the event. In the months before the Walk, GCI Health will work to secure interviews for May May Ali, the daughter of boxing legend Muhammad Ali and a Parkinson's advocate. Ali has worked to support the alliance and raise awareness of the Unity Walk to encourage consumers to form teams and raise funds. The firm is looking to secure interviews with a Washington, DC-based Parkinson's patient to provide another perspective on the importance of research. The organization is also conducting a media tour featuring both Ali and Carol Walton, CEO of the alliance, to drive attendance. A segment on the show The Doctors is also planned. The organization hired GCI Health after a pitch process. For years, the group relied on its sponsors' PR firms, but it was not satisfied with the results, Walton said. So she asked sponsors for extra funding to hire its own firm. The agency officially launched the Unity Walk campaign on January 10 and 11 via a media tour featuring Ali and Walton with national and New York outlets, such as CNN, multiple Sirius XM radio shows, and Good Day New York. In addition to media outreach, GCI is also helping the Alliance improve its website and increase its social media presence, Walton said. Beyond promoting the Unity Walk and the need for funding for research, it is also emphasizing the importance of seeing a neurologist who specializes in movement disorders if diagnosed with Parkinson's.